In the months leading up to the birth of our first child, we were filled with joy, wonder, and excitement with all of our pre-conceived expectations of our soon-to-be expanding family. We had mapped out in our heads all of the amazing milestones our child would reach, and how we would accomplish them as a family. But what we learned at the birth of our son, Jonas, is that your goals can go through a complete upheaval in a single instant. When our son was delivered, we were overwhelmed with happiness, and then the doctor told us that Jonas may be blind. Immediately we were filled with fear and anxiety, and all of the goals we had set, seemed to vanish. Once the reality of our new circumstances set in, it was difficult to not be overtaken by anger and fear of the future, but we were determined to not let Jonas’ disability hold him back from anything in life. He deserved to experience the beauty, and sometimes the ugliness, of life, and we made it our new goal to make sure we could give that to him. After 21 surgeries and the help of dedicated doctors, Jonas was able to gain low-vision, along with the help of glasses. This was a huge turning point for our little family, and while we had spun in so many directions from the start of our new parenthood journey, we knew that when Jonas gained his sight, we could make even more good come from it. Creativity is an incredible outlet to process suffering. Instead of dwelling on our pain, we used creativity to seek solutions and alternative ways to deal with our new circumstances. Rather than looking at Jonas’ lack of sight as a setback, we approached it as an opportunity to reshape our goals and think outside of the box to find what worked best for us. We ultimately chose a new business venture to pour our energy into because that’s what clicked for us, but there are so many other avenues that can help you redirect pain into creativity. There is a community in suffering. There is strength in numbers, and you should never feel you have to go through a difficult moment in life alone. Seek support and if you can’t find it, make it! We decided to create a solution to support others who find themselves in similar circumstances to what we have experienced. This gave us a direct line of communication with that community, where we could even work through issues together. Growth comes through some of life’s worst moments. Often times the most personal growth and greatest things come out of times of suffering and hardship. There’s rarely growth on the “mountaintops” of life. It takes the “valleys” to wake us up and recognize areas of need and growth. Viewing a challenge as an opportunity to grow can help you get through the valley. Rising a child who has a disability is always an ongoing journey, and honestly, there are still many challenges that can get us down from time to time. But the biggest lesson we’ve learned is that unforeseeable challenges truly can be reshaped to spark joy. When faced with a crisis, it’s possible to alter your viewpoint and search for opportunity and creativity, set new goals for your “vision” in life, and become a vehicle for positive change. Husband and wife duo Ben and Laura Harrison launched Jonas Paul Eyewear inspired by the birth of their son, Jonas Paul, who was born with a rare eye condition. Although he was born blind, after 21 surgeries Jonas was able to regain low-vision. 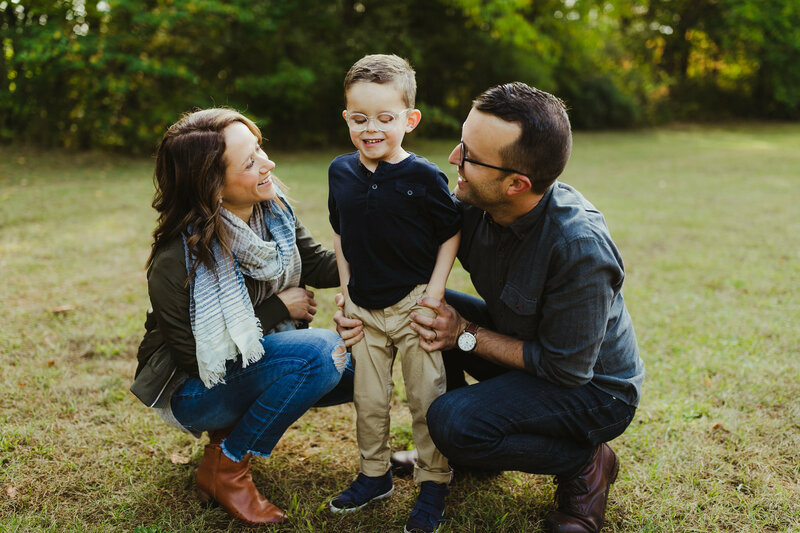 When the time came to find glasses for Jonas, The Harrisons knew they wanted frames that were functional and comfortable, but also stylish enough to help Jonas feel like he was no different from any other children his age. Upon searching for suitable children's eyewear for Jonas, The Harrisons found a gap in the marketplace offering modern and stylish kids eyewear, also at an accessible price point. Driven to help Jonas and other children who need glasses, The Harrisons decided to leave their careers behind to launch Jonas Paul Eyewear in 2013 with the mission of helping children feel beautiful in their glasses and providing sight to children in need with every purchase.